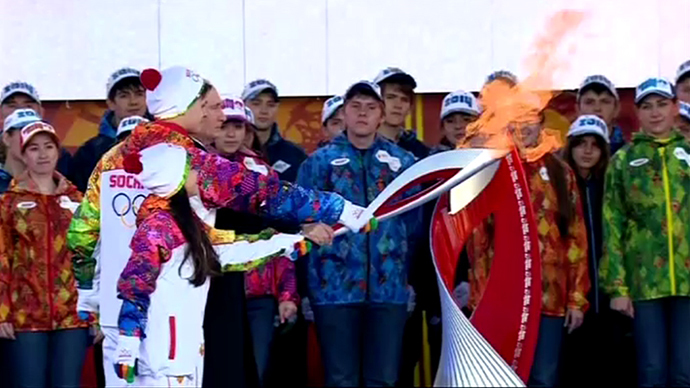 Russian media were up in arms when the Olympic torch went out at the Kremlin on Sunday. It was relit by a security guard. The spotlight was back on the man with the torch, although the fact he was a Soviet champion who had saved many lives was overlooked. Immediately after the incident, Russian social network users and media representatives started to question the symbolism of the whole ceremony of kindling the fire from the sun’s rays in Olympia, Greece and spending so much effort to bring the flame to Moscow. 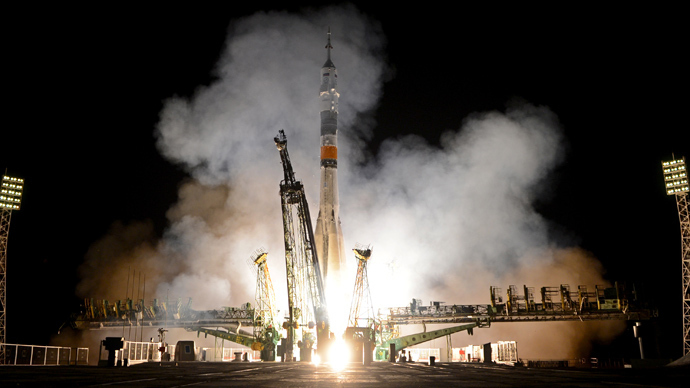 Certain members of the Russian clergy stated it was the will of God as the flame was lit in worship to pagan Gods. “The fire was kindled with a prayer to Zeus and Apollo by a certain high priestess," said a deacon, Andrey Kurayev, adding that it is the reason the holy Orthodox sites located in the Kremlin did not let the fire pass through the premises. Among the critics, were bloggers who were quick with personal insults of the torchbearer, Shavarsh Karapetyan, a former Soviet Armenian finswimmer, with some slurs even carrying an ethnic character. While for many young Russians, Karapetyan, 60, became the man with the flameless torch, back in the Soviet days he was a living legend who saved dozens of lives. Many of the critics did not even bother to figure out why he was among those chosen to carry the Olympic torch. The Honored master of Sports of the USSR is not only a 17-time World Champion, 13-time European Champion and 7-time USSR Champion, but also a national hero for the fact that he saved the lives of people many times. Perhaps the most heroic act is the one that occurred on September 16, 1976. Karapetyan was training with his brother, Kamo, when they saw a trolleybus go off the road and sink to the bottom of the reservoir in the Armenian capital city of Yerevan. The bus was 25 meters off shore, and 10 meters underwater. Shavarsh dived in and managed to locate the bus, despite the clouds of silt that caused almost zero visibility. He broke the back window of the bus with his feet, and began taking passengers to the surface. He managed to save 20 people out of over 90 trapped in the vehicle. On one trip, so exhausted that he didn't realize it wasn't a person, he brought a leather chair out of the bus. Following the rescue, Karapetyan was in hospital for 45 days. He had been injured and had contracted sepsis from the reservoir water. Nevertheless, after his recovery he began training again and set his 11th and last world record of his career. Lung complications and exhaustion have prevented him from swimming competitively ever since. Karapetyan was awarded the Order of the Badge of Honor by the USSR, and another medal "For Saving Drowning People." An asteroid discovered in 1978 has also been named after him, the 3027 Shavarsh. 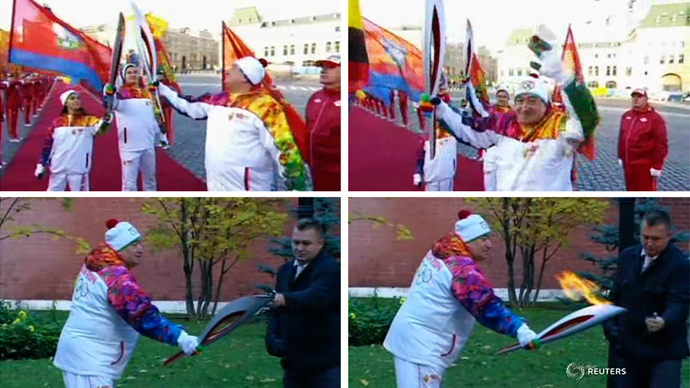 The president of the Sochi-2014 Olympic organizing committee, Dmitry Chernyshenko, has tweeted that as a result of this incident during the ceremonial loop through the Kremlin, many people got to know for the first time who this “legendary man” is. He added that a half-opened valve on the torch preventing the flow of gas was the cause of the incident, adding that no one is going to be fired over the complication. This was not the first incident in Olympic history of a flame being extinguished. During the London Olympics in 2012, the Olympic fire went out when the UK youth rafting team was carrying the torch. In 2008 during the Beijing Olympics the flame began its journey through the streets of Paris. However, it was extinguished four times by the efforts of protesters who attacked the torchbearers. 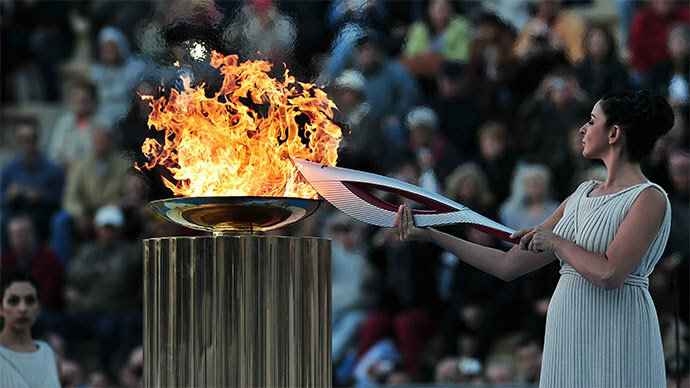 In 2004, the Athens Olympic torch was repeatedly blown out by strong winds during the torch relay. And during the 1976 Olympic Games in Montreal, the fire was snuffed by heavy rains. 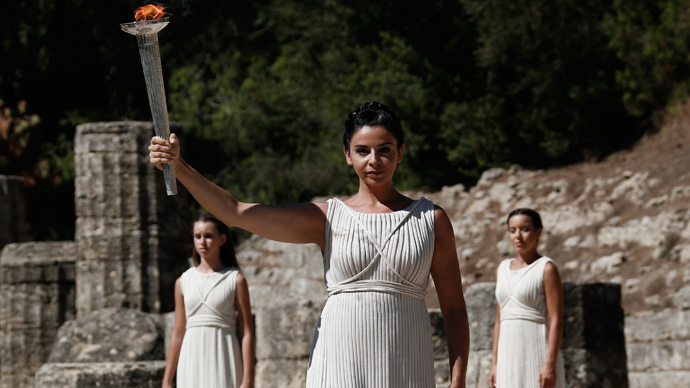 On Sunday, Chernyshenko gave an assurance that every stage of the relay will start with the torch being lit from the 32 special lamps that store the Olympic fire, kindled by the sun’s rays at the Temple of Hera in Olympia.